ESO’s ALMA long baseline array has produced a marvelously detailed image of a distant galaxy being gravitationally lensed. The new image shows star-forming regions, the likes of which have never been seen before in such detail in a galaxy so remote. The new observations are far more detailed than any previously made of such a distant galaxy, including those made using the Hubble Space Telescope, and reveal clumps of star formation in the galaxy equivalent to giant versions of the Orion Nebula. The left panel shows the foreground lensing galaxy as seen via Hubble and the gravitationally lensed galaxy SDP.81. The lensed galaxy forms an almost perfect Einstein Ring but is barely visible. The center image shows the sharp ALMA image of the Einstein ring. The foreground lensing galaxy being invisible to ALMA. On the right, the reconstructed image of the distant galaxy created using sophisticated models of the magnifying gravitational lens reveals fine structures within the ring: several dust clouds within the galaxy thought to be giant cold molecular clouds, the birthplaces of stars and planets. An Einstein ring is a complete circle image of a background galaxy, which is formed when the background galaxy, a massive, foreground galaxy, and the observer are all aligned perfectly. 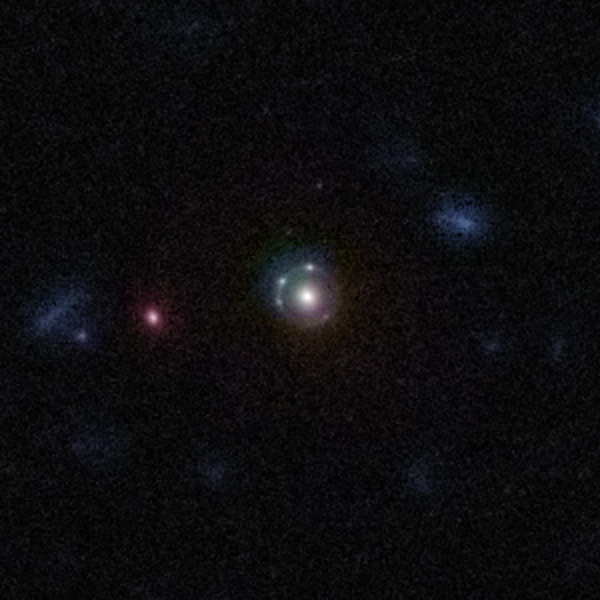 One can be seen in this image of the gravitational lens 5921+0638 taken by the Hubble Space Telescope. Gravitational lenses occur when light travelling towards us from a distant galaxy is magnified and distorted as it encounters a massive object between the galaxy and the observer. These gravitational lenses can effectively extend the range of a telescope, often allowing astronomers to peer much further back into the early Universe than they normally could.